Hey everyone! Welcome to the Blitsy Golden Scissors Blog Hop! Each blog in this hop is giving away a pair of Golden Scissors, which means you have 13 chances to win! 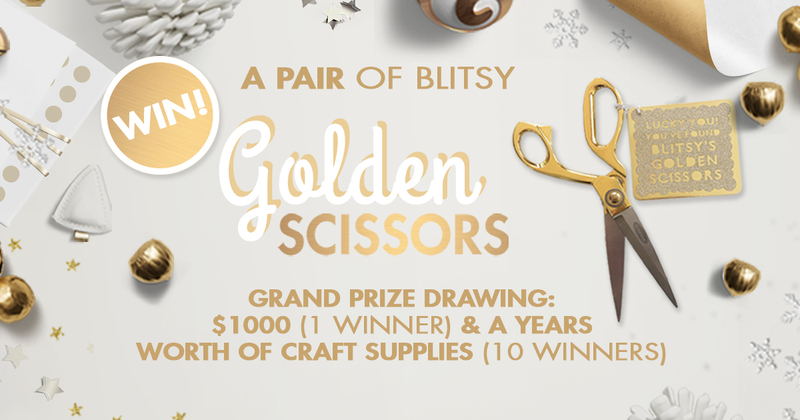 You definitely want a pair of the Golden Scissors because then you’ll be entered into the grand prize drawing for $1000 to spend at Blitsy or a year’s worth of craft supplies! You should have gotten to me from Morena Hockley's Blog. The next stop will be Stacey Gibbon's Blog. For a full list of everyone on the hop, please start at the beginning on Blitsy's Blog! Just leave a comment on each Blog for your entries. Each one of the Creative Team members will be sharing special SNEAK PEEK's of the awesome products and deals this weekend beginning midnight on Black Friday! There will be new sales launching Black Friday at 12am CST, Saturday 6am CST, Sunday 6am CST, and Cyber Monday 6am CST. Get those wish lists and budgets ready - you're not going to want to miss a stop! 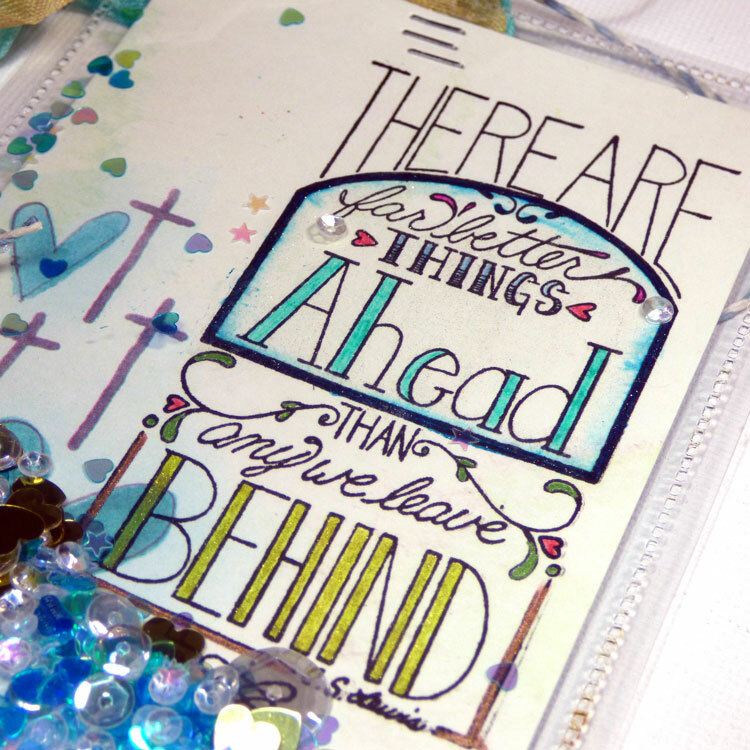 Before you go, I want to leave you with some inspiration as I just LOVE this new Creating In Faith collection. I have not been able to put it aside since I got it. Today I have a book mark and tag for you using just some of the pieces. This shaker bookmark was incredibly easy to create using the 3x4 Journaling Cards in the collection. I stamped this awesome C.S. Lewis quote also in the collection and colored it in with various pens. Then I created the pocket using the awesome We R Memory Keepers Fuse! I love how versatile all the products in the collection are. For my tag, I wanted to play with the Heart & Cross mask. I pulled out some of my favorite Ranger Distress Inks and Dina Wakley Media Heavy Body Acrylic paints - particularly the color Gilt - my current obsession - the perfect gold metallic! I love how it turned out. This same technique could also be applied in your Bible journaling. I think the distress inks would work beautifully on the pages and by just adding a small splattering of the watered down acrylic paint with the Tim Holtz Splatter Brush, it shouldn't warp the pages. I hope you enjoyed these projects today and are inspired to take a look at all the awesome deals to come. Be sure to leave your comments on each blog of the hop for your chance to win 1 of 13 Golden Scissors: I'd LOVE to hear which of the sneak peek deals I've revealed to you today you are MOST excited about! Leave your comment below to let me know. Commenting/entries open until 7pm CST on Thanksgiving, November 26. Winners will be announced during our #blitsysleepover Pajama Party and posted on the Blitsy Blog. Now, don't forget, off you go to Stacey's Blog! I am in love with the Creating In Faith products and have my eye on the Prismacolor pencils and Faber Castell Gelatos! Looking forward to the pajama party too!!! See you there!!! Happy Thanksgiving! MMMM, I want to try the Gelatos and the Glazing Medium! LOVE your projects. wow LOVE your samples of the faith based products!! I got a few of the items recently but none of the women stamps--must get all of them :) thanks!!! Beautiful project. Love the faith based stamps. They went FAST after a live broadcast. Those girls worked fast! Your shaker is too cool, using the fuse tool is perfect. I bought one from Blitsy, and now my gadget loving Daddy has it :-(. It's all cool cuz I'm going to use some of the money I was going to give him for Christmas to buy me another.....LOL. Have a wonderful Thanksgiving! Looking to try out Gelatos! You read my mind! I'd had my eye on the Prima Creating in Faith items because my church women's group is always looking for things to do at our events. I thought it'd be GREAT fun for us to make bookmarks to give away to visitors. Love your examples and looking forward to that sale! Cheers! Love the faith based stamps. Looking forward to the sales. All of the items are dynamite priced and exciting. The golden scissors and shopping spree fabulous. Wonderful Black Friday! Beautiful bookmarks! I love Gelatos. I've yet to perfect making something with them, but they are fun to play with! great projects! I love distress products! and Ranger products in general, I will be looking for that Dylusions sale!! I am sooo excited for this sale! I will pick the Faber Castell Kids Crafts for my grandchildren. Shop on! Great projects! Love the shaker! Happy Thanksgiving!! The bookmark and the tag are gorgeous - I can't wait to make some to give to friends, reminding them of hope in such a sad current world environment! 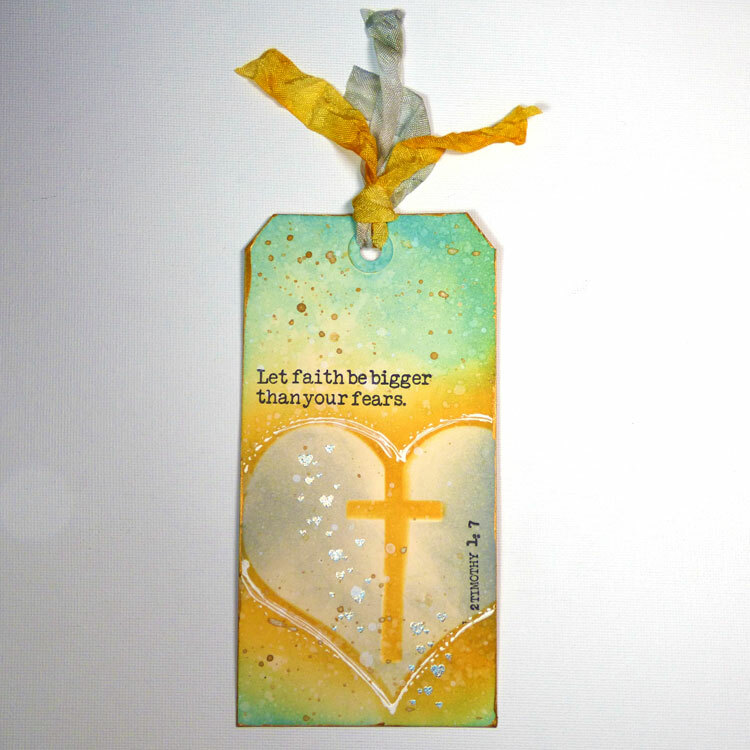 I love your tag and will definitely be checking out the Creating in Faith products. Great little bookmarks. My favorite is the shaker....I love shaker anything. Great designs. I love your shaker cards and tag! I have been eyeing the Faith collection because I do love everything Prima! I must say the gelatos and the Prismacolor pencils are on my list as well! Oh boy, my list is already too long! My favorite stop along the hop! I adore that shaker bookmark & that quote is perfect. Such a great idea. Love it! Thanks for sharing Miss Carisa! Hope you have a wonderful Thanksgiving! Love the Faith tag! Thank you for sharing. Beautiful cards. I really like the shaker bookmark. I seem to collect inks. I've been wanting to try the Ranger Dylusions. I see they will be on sale and I'll try to take advantage of that. There are gelatos and some pencils - can add to my collection. I love that Heart & Cross mask. That tag really is beautiful! And your correct that it is the perfect gold metallic because it looks perfect to me. I must have the Prima Creating in Faith stamps. But I'm sure I'll pick up some Dylusions as well. Thank you for the great projects. I love anything with sequins. The bookmarks look like great encouragement for my friends facing cancer. Love the scissors!! I need some type of storage for my dies. Even the new edgeables!!! 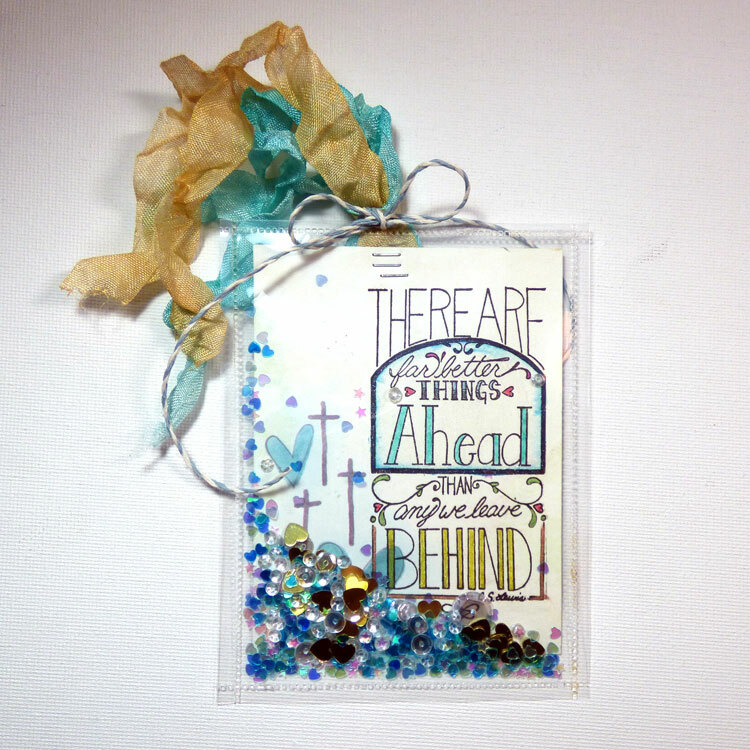 Beautiful card and bookmark love the prima creating faith stamps! Thanks for sharing. Love these items! Can't wait to see the sale on Jaimie's products. Ok! It's going to be tough!! I have to decide between Copics and Prismacolor pencils!! Beautiful tags!! I'd love to try some Faber Castell Gelatos! I've always wanted to try the Gelatos and that Fuse Tool looks fabulous! Love your shaker, and the tag is beautiful! I have never done any stamping, but this looks like fun! Awesome sight! Can't wait to get back on after the festivities at our house are over! What great ideas! Everyone has to have a wink of Stella! HI, THESE ARE MY FAVORITES:Prima Marketing Creating In Faith collection (3x4 Journaling Cards, Cling Stamp - Better, Mask - Heart & Cross, Cling Stamp - Bible Book). THANKS FOR SHARING! Love you shaker tag - hoping to shop for the Prismacolor Pencils - Great Sales! Ive never used gelatos but would love to try them! I am so glad you wrote about the colored pencils, I collect craft materials for my grands to make things while they stay with me, and we need pencils! So super excited for these amazing deals! Alot of them have been on my wish list for quite some time so now I will be able to finally get them! I can't wait! Shakers are so much fun to do! I have done many for my dashboard on my planner. Your tags are Gorgeous!! I NEED those Gelatos!!! Fabulous creations. 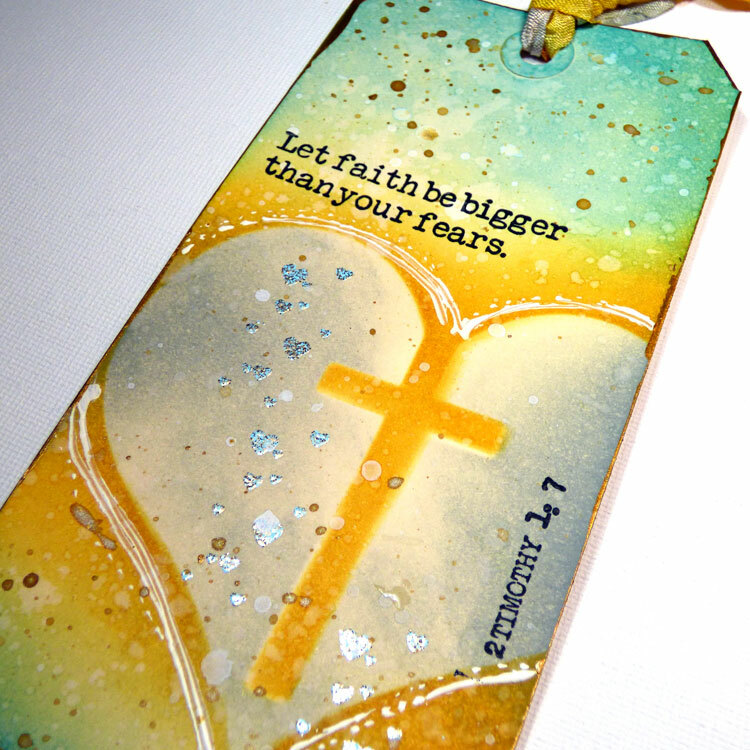 I like the creating in Faith collection--would be great for our church card ministry. Definitely looking forward to have the Prima Creating in Faith collection. God bless you! I LOVE both of your projects. The stamps are awesome! You have great ideas. Wanna win those golden scissors! Love your use of the Fuse on that first bookmark - thank you for the inspiration! Thanks for introducing me to Creating in Faith products. They are great. I'm now eager for the sale. Love what you made out of Creating with Faith.. Thanks for sharing. I would love the double scoop gelatos set! I'm looking for tools to make my own rubber stamps. I need to add more religious cards to my repetoire. Looks great. Love it all. Can't wait to see more. Happy Thanksgiving to you all! LOVE the Tags....especially the Shaker one!!! I'm interested in the Copic Sketch Markers, Pens, & Storage Deals!!! And wouldn't mind being one of the Lucky Winners of the Golden Scissors!! Great tags! I love the Gelatos and of course golden scissors! I am so loving the faith journaling. I have my eye on those Prisma colored pencils for sure.I wonder if my budget can handle all that I want. Love the faith based stamps! The gelatos are on my wishlist and double scoop of anything is a good thing -right! Thanks for sharing your neat ideas for new crafts to make. I totally want to try out the Gelatos... And I would love to add a pair of golden scissors to my crafty tool box. Great ideas here. Glad I stopped by. Happy Thanksgiving! Your shaker bookmark and tag are AWESOME! I would love some of the Creating in Faith journaling cards, stamps and rub-ons. And now you have me lusting after Dina Wakely's lovely paint in Gilt! BARGAINS GALORE with LOTS of goodies to tempt me!!! THANK YOU for the chance to win a PRECIOUS pair of GLORIOUS Golden Scissors!!! Golden scissors!!! That's an awesome giveaway!! And i got to get my hands on gelatos now!! Love the tags! That is a great deal on Prismacolor pencils - woah! Since my son borrowed my Prismacolor pencils and kept them...I would love a new set ... and Golden scissors ! The Prismacolor Colored Pencils though I want to see how much Copics will be! Those shaker book marks are awesome! I've got to get "shakin'" and try that technique! Gelatos on sale!!! WoooHoooo!!! My choice!! I'm excited for the Copic marker sale! Thanks for sharing! Your tags are gorgeous!! Gelatos on sale? yay! I've wanted to check those out. I need to build up my distress inks so I am hoping for a sale on those too. So pretty. Sale? Love that idea. Love the shaker bookmark!! Beautiful!! Thanks for the inspiration!! I am in love with the Faith Based stuff for Art Journaling - most of my pages are Scripture based and these things make me twitchy to have 'em! I really want that pair of Golden Scissors!! Should be fun! Maybe this will be my chance to finally get some Copics. I love the shaker bookmark!!! :) what an amazing idea! Nice crafts! Happy Thanksgiving! The gelatos are on my list! I'm trying to get into bible journaling and I've heard so many great things about the gelatos! I am so excited for those sales. Great projects. Happy Turkey day!! I actually hadn't heard of the Prima Creating in Faith collection, but I'll be checking it our for sure! Sounds like its right up my alley! "I cant wait for the sale, Im so excited, :)"
I love your bookmarks. I'm especially excited about the prism colored pencil set. I'm always trying to hide them from the kids but it's about time they have they're own set. All of my art is faith-based giving all the glory to God the Father for my talent! Happy Thanksgiving! I am excited about the prisma colored pencils! Lovely bookmark! Hope I win the scissors! I love the stamps and the gelatos are to die for. I am so excited after seeing the bookmarks as well. I wish everyone could win the golden scissors. I love your Shaker bookmark, what a great idea! Can't wait to see all of the deals! Fun projects! Bring on the deals! I am excited for the glazing medium and the Copic Sketch Markers. I haven't tried either, but am looking forward to it! Gosh! The glazing medium, Gelatos, and Copic markers are exciting! I have been wanting to try them! LOVE your work!! I've just discovered Copic markers -- can't wait to try more!! THANKS for sharing!! I love copic markers and prisma pencils! Excited for Prisma Pencils and Creating in Faith sales!! Thank you for sharing your inspiration! What an incredible sale on the Prisma pencils! Prima is my absolutely most favoritest brand out there! All there products are amazing! Love your projects, especially the shaker tag. I think I might try that one for some gifts! Love your blog...thanks! The faith based stamps are lovely, can't wait to create with them. I would love to try some stamping projects. I'm excited to see the sales on Dina's products! Such a fun weekend! I can't wait to get past the turkey! My Favorite Black Friday Deals at Blitsy!